Home of William and Blanche Hinman Garland, ca. 1901. A COLLEAGUE RESEARCHING the original St. James Park in the West Adams historic district came across a mention of Garland Hall, a graceful mansion that originally occupied the lot on the northwest corner of West Adams Boulevard and South St. James Place. 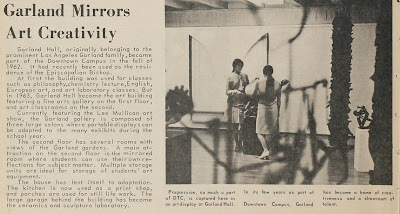 Garland Hall, we were surprised to learn, was briefly part of the original Downtown Campus of Mount St. Mary's. 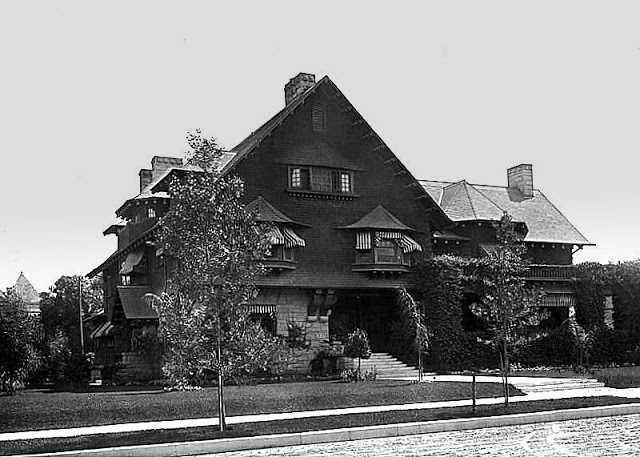 The house at 815 W. Adams Blvd. was built by real estate developer William "Billy" Garland around 1901 and occupied by Garland (who died in 1948) and his widow until her death in 1958. 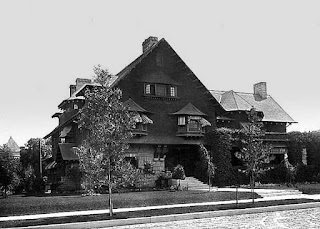 It was never part of the Doheny compound next door on Chester Place, and its Mount connection lasted only a few years. When Blanche Garland died in 1958 she deeded the property to the Episcopal Diocese of Los Angeles, which in turn sold it to the Catholic Archdiocese. 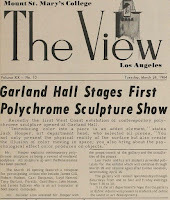 Thus it was literally in the neighborhood and available when the Mount opened Downtown in the fall of 1962.
was used as a sculpture studio. The Catholic Archdiocese sold the building and it was demolished in 1972, to be replaced with nondescript apartments, something that was happening to stately homes all over the area. But for a almost a decade it was home to art exhibits, music performances and aspiring young artists. Discovering the existence of Garland Hall might also solve a little mystery that has intrigued us for years. During a cleaning up operation a few years ago, a number of paintings turned up in storage in the Doheny Mansion. Some were by prominent Los Angeles artists, including Mount benefactor José Drudis-Biada, complete with exhibit information and price tags. But they had been jammed rather haphazardly into two closets in the basement and left there for the next 45 years. 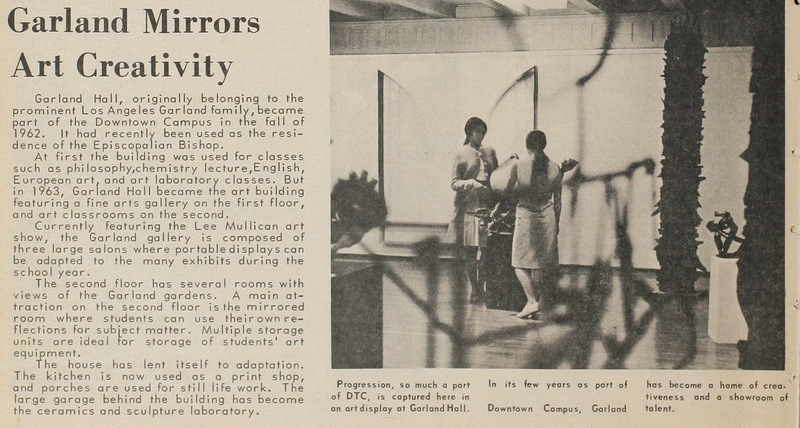 Perhaps they once graced the gallery in Garland Hall. 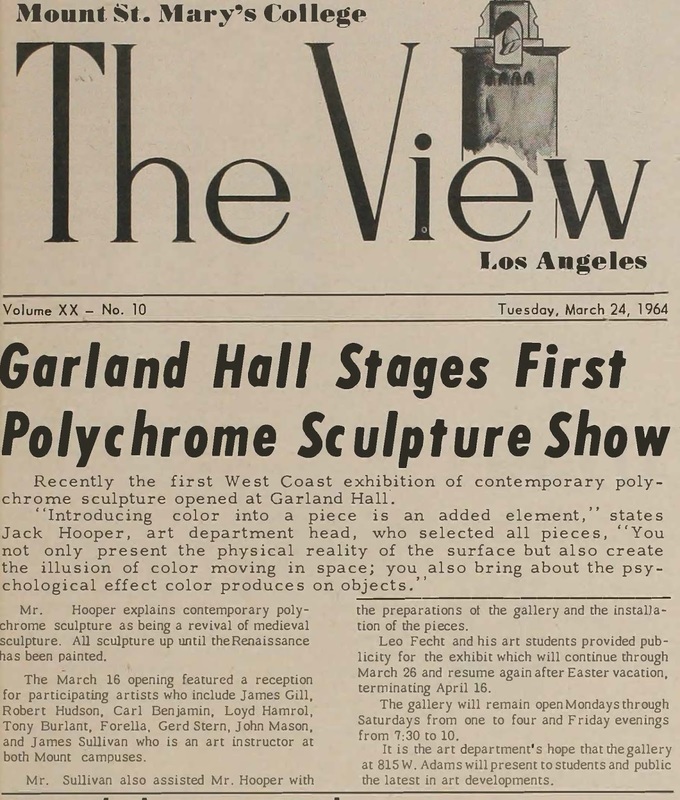 A writeup for an exhibit in The View, October 15, 1964.